This advanced cutting tool design combines into one operation, instead of two, the preparation of shallow cored holes for insertion of Hubbard (Welch Type) Expansion Plugs. Correct counter bore diameter for each specific plug diameter. Proper width of the bottom of the counter bore – equal to the thickness of the material. Correct angle between the cylindrical sides and the bottom of the counter bore – 96 degrees. Includes a chamfer at the top lip of the counter bore at a bore depth of approximately 1-1/2 material thickness. This functions as a lead in for plug insertion and is a nice feature considering the close fit of the bore and the expansion plug. Stout, rigid cutting tool design eliminates chatter and insures the accuracy essential to machining square shouldered, leak-proof holes free of burrs and fillets. Tooling appropriate for both low and high volume production work – T-15 tool steel and C-6 Carbide available. Standard shank sizes that will work in any cutting tool holding system. 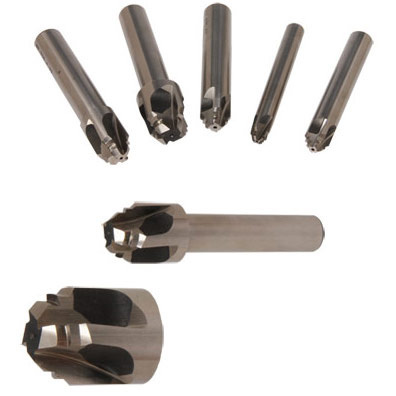 Cutting tools can be sent back to us for sharpening. Maximizes sealing effectiveness of Hubbard (Welch Type) Expansion Plugs and Ground Plugs.